I’ve always been fascinated with the diversity and intricacy of organisms as well as the hands on, creative nature of making something. Through my studies I discovered biomechanics and biologically inspired design, fields where my once separate interests of biology and engineering were not only joined together but built off each other – knowledge in one subject leading to growth in the other. While in college, I started searching for opportunities that would help me get as much exposure as I could to the field that I loved. I was very lucky to find a mentor in Dr. Sheila Patek through the Army Educational Outreach Program’s (AEOP) Undergraduate Research Apprenticeship Program (URAP). 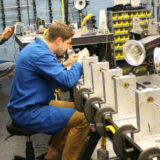 URAP provides undergraduate students with an authentic science and engineering research experience alongside university researchers in a university lab setting. This internship blossomed into a position as a lab technician at the Patek lab at Duke University where I am currently working. It was Dr. Patek who first encouraged me to attend this year’s Society for Integrative & Comparative Biology (SICB) Annual Meeting in San Francisco. Dr. Patek had helped me make strides in my research project, which explores a novel way of measuring the energy released during a trap jaw ant’s mandible strike. She encouraged me to present my preliminary findings at the conference and get more exposure to the field of biomechanics. She explained that the SICB symposium would also be a great opportunity to meet like-minded researchers and leaders in the field. While I was excited to apply, I was well aware that San Francisco and Durham are not exactly neighboring cities. Knowing that I could not afford to attend without support, I applied for AEOP’s Travel Symposia Award. This award from AEOP and Batelle allowed me to register for and attend the conference without the strain of worrying about how I would afford to get there. The five-day conference focuses mainly on the fields of biomechanics, evolution and comparative physiology and showcases research done by scientists around the world. 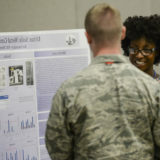 As well as having focused seminars throughout the event, there were two-hour blocks where attendees could present their own work in the form of a poster presentation. During one of the blocks, I was able to present the research I had been doing at the Patek lab and get valuable feedback on how I could improve my experimental setup and collect more kinds of data. Since the conference, I’ve already improved my experimental setup as per the suggestions of my peers. Before the conference, I was having trouble finding labs and research related to biologically inspired design, which is the field I am most interested in. This conference not only strengthened my interests in the field, but it also provided me with multiple avenues of pursuing this interest. While in attendance, I was surprised by how many biomechanics labs there are that are grappling with similar problems that I have when measuring organism performance. It was so valuable to hear about how they approached these problems and this new knowledge provided me with a new perspective on how to tackle these challenges. For example, while measuring the flight performance of a fruit fly might not be directly relevant to my work with trap jaw ants, there are a lot of research questions that overlap. Both study organisms are small and perform fast motions so methods on how to measure energy output and tips on how to work at such a small scale were greatly appreciated. Thanks to this unique gathering of researchers from diverse backgrounds under one roof, I was able to leave with ideas for upcoming collaborations and get unique feedback that would be hard to find anywhere else. Fueled by this conference and my growing interest for this field, I plan to pursue a Ph.D. in Biology and hope to start graduate school next Fall. Since most of my experience lies on the biological side of things, I am applying to schools with biomechanics labs that work closely with engineers in order to make discoveries that impact the fields of biology and engineering. In the meantime, I am looking forward to continuing to refine my experiment and trying out the different suggestions that I received from professors and fellow researchers that I met at SICB. Overall, I’m very thankful for having had this opportunity to grow as a scientist and make key connections that will further my professional growth in this field. 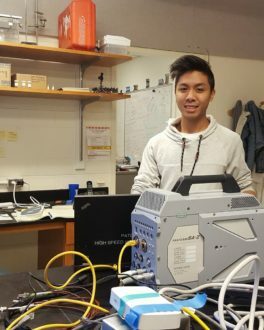 From this experience, I’ve learned how valuable input from the rest of the engineering and biology community can be and have been introduced to new ways of thinking about my own experiment and my own future. I highly encourage anyone who is interested in a field of research but wants to know more about the kinds of projects being conducted in that field to seek out and attend conferences like SICB. With the Travel Symposia Award, you can broaden your search to anywhere in the United States. You would be surprised to see how many other researchers are out there that share your passions and are curious about the same things that you are. Engage in technical symposia to showcase the STEM research you’re doing now, or that you did in an AEOP program!